It was during one of those after-college evenings when me and my friend M went to Hot Breads,hungry enough to eat the whole shop.We didn’t have much cash with us but still wanted a Black forest Pastry each.I remember it cost about 20 bucks and we just had 50rs/- with us.We bought 2 of them,paid the lone fifty rupee note and waited to collect the balance.The shopkeeper gave us 60 rs back thinking we gave a 100 rupee note. *Ok,I’m not so proud of this but still sharing it with you all*.We just glanced at each other and ran from there-literally,holding our pastry and the unexpected extra cash..hah those were the good ol’ days..;). I never expected in my wildest dreams that I would be baking my own Blackforest cake some day.Leave alone BF cake,I didn’t even think I could cook a proper regular meal..:).I guess with each passing day,we learn. I’ve seen indefinite number of recipes for Blackforest cake but every time I zero in on one,I get jittery and then I drop the whole plan.But today I had to make one,I work well under pressure,I guess.My dearest ma-in-law is celebrating her 60th birthday and the least I could do is make something for her.Thats why the eggless cake. I cried out loud or rather twittered aloud for help regarding the cake and my dear friends Ria,Aparna and Deeba gave me the necessary push and encouraged me to go for it.Thanks to you guys or else I would have taken the nearest escape route ahead and made something much much simpler. I chose this recipe from Vanitha magazine amongst an array of dishes using Milkmaid.I’ve seen a similar recipe at Srivalli’s and Renuka’s place.A simple eggless chocolate cake which can be whipped up in no time. Melt butter-Microwave for 1 minute on high.Let it cool. Add milkmaid and beat well. Sift together maida,cocoa powder,baking powder and baking soda. Add maida mix to the milkmaid-butter mixture alternating with cola till maida and cola are finished. Pour into the greased baking tin and bake for 30-40 minutes or till a toothpick inserted comes out clean. In a thick bottom pan,mix the sugar and water and boil till the sugar melts.Keep aside to cool. Keep cream and the beater blades in the freezer for about half an hour. Add sugar and essence to the chilled cream. Beat well till the cream is thick and forms soft peaks. A cup of cherries chopped fine-I used glazed cherries-reserve a few for garnishing on top. A bar of milk chocolate – Make chocolate shavings out of the bar and keep refrigerated till use. Cut the cake into 3-4 layers horizontally[I cut it into 3 layers]. Keep one layer of the cake on the serving plate. Sprinkle 3-4 tablespoons of sugar syrup on it. Now spread 2-3 tablespoons of whipped cream on top of the cake. Cover the cake completely with whipped cream on all sides and the top. Level the top and sides with a broad spatula dipped in chilled water. Decorate the top with chocolate shavings,halved cherries and silver beads. Keep chilled in the fridge till use. 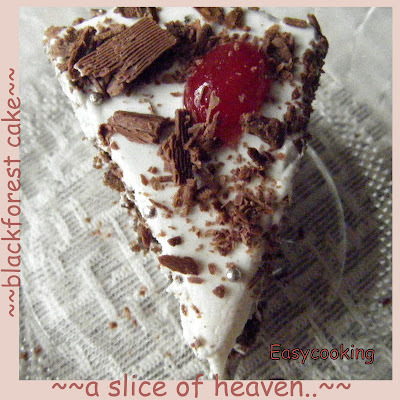 Divya,wowt,who can resist a blackforest cake ? Came out perfect and professional even without egg..I loved your recipe and will be trying this asap. hmmm divya...Loved that eggless version dear..pepsi in cake...really need to try this version next time...bookmarked.. So you did make it. It looks very good. Hope your mother-in-law had a great birthday. Wow Divya! 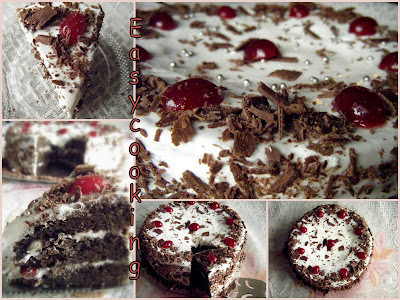 I never knew we could make Black Forest cake without any eggs! I have bookmarked this recipe. Thanks so much for sharing. Cake looks lovely.And lovely frosting as well!Wish I had a slice. beautiful. Please wish your MIL a very happy birthday! Yummilicious cake... Neat presentation. I too have the recipe saved from Vanitha. Yet to try it though. Wow Divya, u hit the mark with this favorite cake of mine :) its come out so perfect ! with the beads and all. Wow this is really good. Delicious... would love a big slice of the cake. drooling over here! Gorgegous looking cake Divya! Super delicious cake. Nice clicks. wooooow !!! It looks so so yummy with all the frosting and the silver beads. Nice job Divya. Thats mouth-watering, I am gonna break from my diet to taste it! It looks absolutely yummy.. I am in hyper happiness in seeing this recipe. I have always wanted to make a black forest cake and this one looks perfect and neat. Would try it right away. First time here and I am glad that I am here. will keep visiting. keep it up. This is my first time here..The black forest cake does remind me of my college days now that you mentioned your story!Your cake looks lovely! Thanks Divya for stopping by my blog. Your cake looks awesome. I should try it one time with the coke. I'm sure it helps in the cake rising. Ur receipe is too good & too simple for making. I'll definetely made it at my home.Thank u for the receipe. By. Hi Divya..I am going to try this Eggless BF recipe today. Making it for my little newphew who is allergic to eggs. I hope mine turns out as good as urs. I wanted to bake for my mother's birthday since she is vegetarian. In the past I have baked eggless cake using the soft drink but the end result wasn't so good. The cake turned out very dry and hard, not soft at all. So I skeptical to bake this cake at first. But then I thought let me try. I followed the recipe as it is. Everybody loved it, escpecially my mom. I guess since this is eggless it will be hard not so soft as the cake with eggs. Overall I'm happy with how it turned out. Will use this recipe again. Thanks for posting. Hi,Thanks a lot for the recipe.I just have a question about condensed milk.It is condensed milk or Evopareted milk. I tried the same recipe but my cake was bit hard and dry.Any suggestion? I am a silent admirer of yourf blog for a long time...I love your recipes and am also grateful that I have been introduced to other food blogs through yours! I wanted to make a special mention of this cake...I made it following your instructions for my husband's birthday two years ago (yeah, I know...my comment is really late...but better late than never) and I must tell you, its the best recipe I have tried! Everyone at the party loved it! Thanks again and I will keep reading your lovely blog! Great work! Tried this for my son's bday and it came out lovely just like a store bought one!! Looked and tasted superb. Thanks for the best recipe. Yummy... Photos of the food always helps and tempts in trying the receipe. I must tell you I love the cake that I had baked using your receipe. I made a slight variation, for getting the juicy effect, I put mixed fruit juice on the cake layers and then turned to a fresh fruit cream with the fruits sliced and diced in between the layers and on the top along with the cream. It was awesome. Cheers! Hi Divya. This is by far the best recipe I've tried and I can't thank you enough for posting it! I've tried this around 3 times and it has come out just about perfect. Though i do have a question..."Can I use a microwave, instead of an oven, to bake this?" and if I can "Can I preheat and continue to use the same temperature as when using the oven?" Hi Divya...I was going through your blog and came across this black forest recipe.Am thinking of trying it out on my hubby's b'day...which is on 15th Sep.All his family would be there...hoping that it comes as good as yours..can you give me any pointers on the same as this is the first time I'm baking a cake. i just loved all ur posts...in one of ur post , u wrote that u ve a IFB convection microwave oven.i ve the same...nd i am despirately looking for its settings for baking purpose...what mode i need to set nd at what temperature.please please reply. Hi i want to know what is the alternative for using cola?? 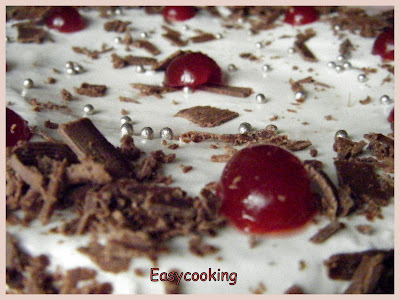 Hi I came across this eggless black forest cake recipe. can you give me tips on how to slice the cake horizontally to make 2 or 3 layers? First of all congratulations on putting up such a great site together. I love the detailed description and step by step process well explained with words and pictures. Your recipes work very well for me... almost always. I have bookmarked your site, RSSed it on my yahoo page and keep coming back. Great work. Keep it up! Yummmmmmmmmmmm.......lovely texture and of course,taste!!!!!! This cake came out terrible & sunk in the middle of it because it has no eggs!!! Ugh, it taste disgusting too!! DON'T MAKE THIS! It's a waste of ingredients! Hey Anon,if you think eggless cakes sink in the middle,you are badly mistaken.This is a tried and tested recipe and many people have tried it with great results.Sorry that it didn't come out well for you AND that doesn't make this cake disgusting.Please be nice while posting comments because there is a delete option for comments too! Yes you can,just keep a tab on the baking time.Glass dishes take a tad bit longer to bake than the aluminium/non-stick counterparts. 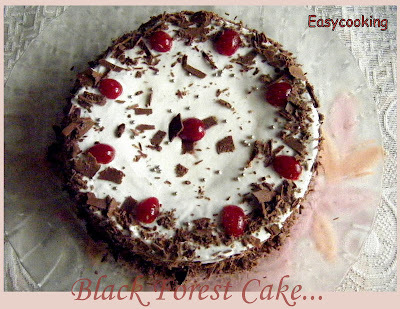 Hi Divya, I tried your black forest cake. It came out very well. I just love this cake. I have put the recipe in my website and ofcourse have given credit to you. Thanks for sharing this recipe. Hi Divya! Thank you SOO much for sharing this amazing recipe.. After a lot of I'll do it next week oh no definitely the week afters.. I finally baked this today.. It came out awesome! Thanks again.. And your recipe of paneer tikka was awesome as well! Which cream brand did you use for icing? Hi Divya! your recipe was outstanding your cake soooooooooo tasty! it was yummy i have try your recipe on my mom birth day so please send more recipe so we become yourvery biiiiiiiiiiig fanah! the cake turned out brilliant. I tried the rich chocolate cake too.just the way u did.simply brilliant, everyone loved it.even this cake i substituted cherries with strawberries.Simply brilliant. Hi, Divya! I tried this recipe yesterday and it turned out quite nicely. And the cola taste came out a bit too strong for my liking. Maybe it's because of the cola I used? I used Pepsi Zero, by the way, because I thought using the ordinary one would make the cake really sweet. But this is an interesting recipe and I think I'm going to try making this again. I hope it comes out better. I have IFB SC3 Convection Microwave. I have 2 modes in Convection C1 and C2. Which mode do i need to keep it and for how long? Do i need to pre heat the IFB? Kindly Reply!! I have the same model,but not sure what C1 and C2 is.I just press the convection button,set the temperature and the time and then bake! I use Amul cream and I agree it can get difficult to whip it up to peaks.I try by keeping the beaters and the bowl in the freezer prior to beating and beating the cream in a bowl placed inside another bigger bowl full of ice. thanks for sharing such wonderful recipe. Can we use home malai for icing ? It forms butter while beating so plz give some suggestion. Turn off the beater when the cream forms stiff peaks.If you beat further the cream will turn into butter.You can use homemade malai. Thank you.Butter can be replaced with the same amount of oil. Hi, I'm planning this cake for valentines day and I even bought a 5'' heart shape cake pan :) Can I make this in two layers in a heart shape pan? Will it come out well? Also, how should I cut it into layers? And what measurements should I use for the ingredients? P.S: I have a pan of this size. Hope it helps. I am not sure how big the pan is,so I'd suggest halve the recipe and try it first.Since it would be a small cake,you can cut the cake into two horizontally and ice it. Hi, I tried the recipe exactly today with amazing results! Thank you so much both for the recipe and your help. I used half of all the ingredients. I'll post a picture soon on my blog and link it back to you. Once again, thanks for the recipe! Hey Divya...Hi! I tried this recipe and it worked great! Many thanks for sharing and infact I posted this on pinterest so other folks know about this:) Happy cooking! hi divya... cn i use pressure cooker for this cake. pls rpy me...coz i dnt have oven.n i want to make dis cake on my hubby's bday party. .. I haven't tried baking this cake in a pressure cooker myself,but yes it can work out well as Manasa has mentioned. Hi divya..........can i use hand whisk to beat amul cream as i do not have a blender. plz reply. Using a hand whisk will be a laborious process since amul cream is a bit difficult to whip even with an electric blender.However,I would not dissuade you from trying it out! Glad you liked the cake.You need not cover the loaf pan,bake it without the lid. Oh,sorry to hear that.Cakes tend to sink in the middle if the batter is not cooked through.When you test the cake using a skewer,if it doesn't come clean bake further for some more time. I have IFB SC3 Convection Microwave. I have 2 modes Convection and micr+conv. Which mode do i need to keep it and for how long? Use the Convection mode.The timing is the same as given in the recipe. I haven't tried baking in pressure cooker,so cannot say for sure,sorry! can this cake be cooked in a gas oven? can it be baked in a gas oven, instead of microwave? I guess so.Just follow the regular temperature you bake at since every oven is different. hiii i want to prepare eggless chocolate cake in pressure cooker for my husbands first b'day...how can i prepare? Hi Divya. I tried this and my color was pretty light. What cocoa powder did you use? I use Cadbury's.The cocoa powder available in Niligiris is pretty good too! I tried making this cake last night and it bubbled over the side of the pan and would not cook in the middle. I think it might have something to do with the pop and I used a fresh can, should the pop have been flat? I guess by Pop you mean soda.The recipe requires a fresh soda not flat.I am guessing the size of the pan you used was small. this recipe is not too good because the taste is not as good as market.. Both are very different.. I've made this cake a couple of times successfully and so have many others.I am sorry if it didn't match your expectations. Hi divya. Thanks for the wonderful recipe. I wish to try this recipe for my wedding anniversary. I don't have a kitchen scale. Can u pls advice me the quantity taken for maida in terms of cups? Hope to hear from u asap. Hi! I tried this recipe just today. I guess I'm five years late to the party, and everyone reading this already knows, but I want to say it anyway. This recipe is FANTASTIC! I followed this to the letter, and the result was the best homemade cake I've eaten in my life. I didn't honestly think I was capable of baking such a delicious cake. I have made this recipe 100 time and everytime it was a super hit. thanks a lot.